Moyno is now the world’s largest manufacturer of progressive cavity pumps. These products have a variety of applications in water and waste water, pulp and paper, specialty chemicals, pharmaceutical, food and beverage, mining and mineral processing, oil and gas, energy, solar and agricultural. Moyno’s small progressive cavity pump is designed for use where low flow transfer duties are required. 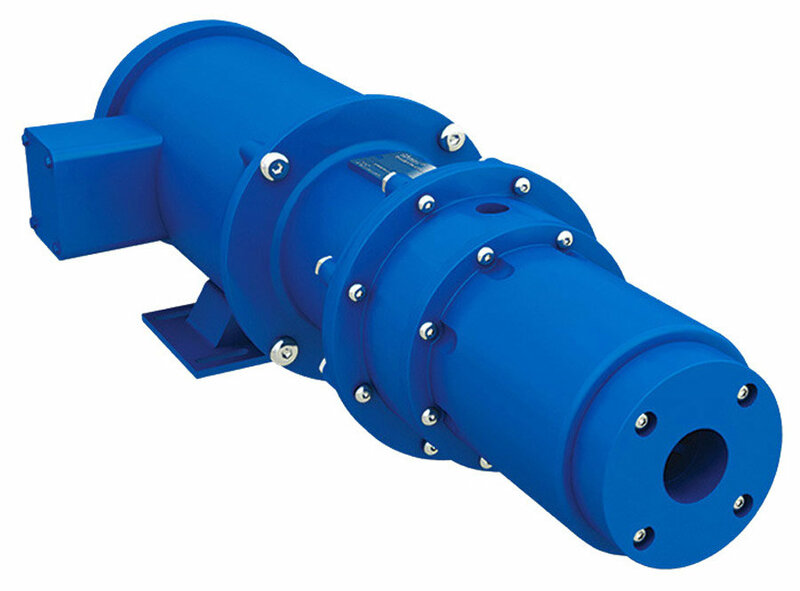 These self-priming pumps can achieve suction lifts up to 26 feet. These pumps can be found in a variety of materials including cast iron, stainless steel, or engineered co-polymer bodies. Mag drive series are the first progressing cavity wobble stator pumps to offer magnetic drives. The proprietary, magnetic coupling design performs well in hazardous applications and is effective with difficult to seal fluids. This ensures operator safety and protects the environment from contamination. Features integral shaft bearings specifically designed for applications that require the transfer of highly viscous fluids and solids where a close coupled configuration is preferred, but the robustness of a gear joint is desired. Traditional close coupled pump specifically designed for applications that require the transfer of highly viscous fluids and solids where a close coupled configuration is preferred, but the robustness of a gear joint is desired. Versatile, high performance pump designed to handle a wide range of applications from shear-sensitive chemicals to difficult to process slurries and sludges. Versatile, high performance pump featuring a wide, open throat hopper design that minimizes plugging that could occur in a standard inlet. Suited for handling semi-dry, high solids content fluids that have a tendency to “bridge” in the inlet hopper. 45 degree inlet lowers friction loss and provides for gentler handling of the product. The EZstrip Transfer Pump has been designed to have easier maintenance than ever before. 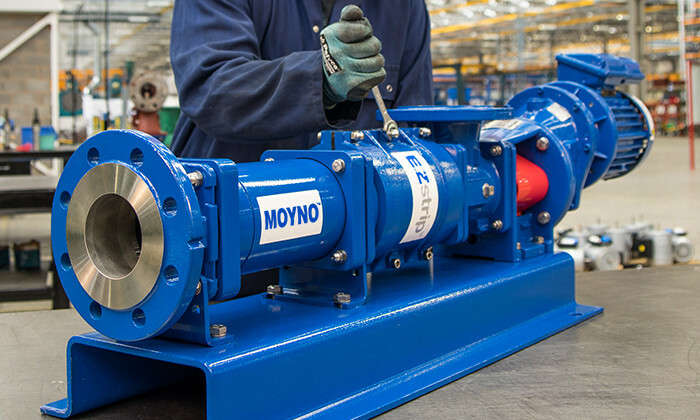 In addition to the patented split suction chamber, Moyno removed the tie bars, designed a new positive torque split coupling rod, and added in a captive support foot. That means faster, easier maintenance for you. The EZstrip has been specifically designed to provide a quick and easy way to disassemble, de-rag and maintain a PC pump in-situ, eliminating the costly maintenance and down time that servicing can often cause. The EZstrip Cake Pump features a specially designed feed chamber that can easily be disconnected allowing access to the rotating assembly. The rotor can be separated from the conveyor allowing removal of the rotor and stator all within its own assembled length. This process can take as little as 6 minutes. 500 Sanitary Pumps offer low flows and high performance in a compact, cost effective size. Made of food grade 316 stainless steel to meet 3A sanitary standards, this versatile pump also features elastomers that satisfy FDA requirements. The AugMentor Pump Stuffer handles high-viscosity materials otherwise unpumpable by conventional means. 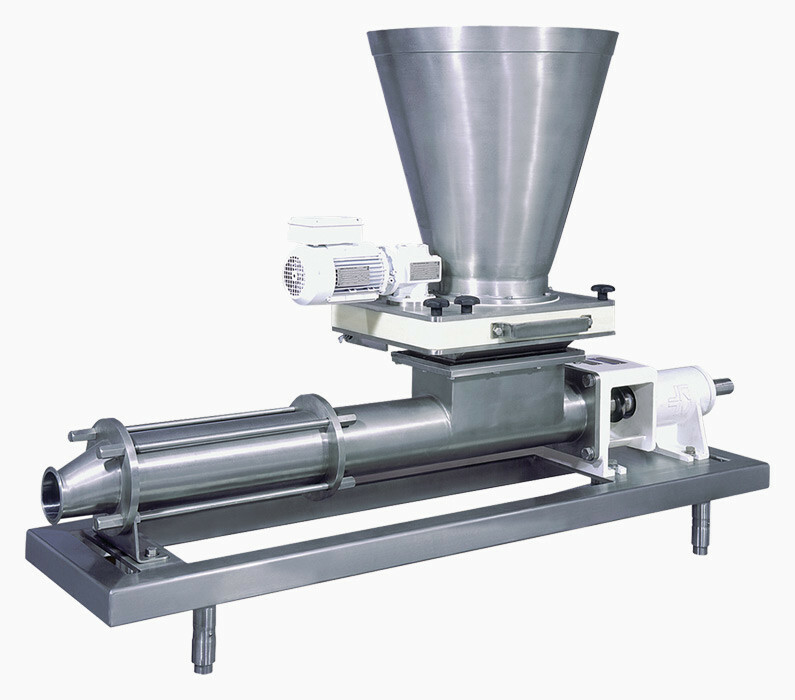 Materials in excess of 1,000,000 cps, such as cold processed meats and bakery dough, are easily fed by the AugMentors slow-speed, bottom- drive auger. Moyno has created a food products processor that combines solids reduction and transfer pumping into one efficient unit. The patented Chopper Hopper is a unique and aggressive solids reduction pumping system that reduces whole produce into an easy to handle puree or mash. Low-Shear, non-pulsating Sanitary pumps transfer shear sensitive materials with minimum stress or turbulence. The InviziQ Pressure Sewer System is a smarter alternative to conventional gravity sewage options. Rather than relying on gravity and a network of costly lift stations to transfer sewage, PSS utilizes reliable grinding and pumping technology to efficiently and responsibly move sewage to treatment facilities – no matter the terrain, slope, and environmental sensitivity of the area or complex topography of the region. MOYNO TRI-PHAZE patented design handles high gas volume fractions without premature breakdown of the stator due to excessive heat build up. Prompted by a market need for a more efficient multi-phase fluid transfer solution, Moyno, inc. developed the breakthrough Moyno Tri-Phaze System. Its patented progressing cavity design effectively pumps oil, gas and water from the well site or satellite through a single pipeline to a remote processing station without degradation or emulsification of the fluids. Progressing cavity pump mine dewatering systems have been employed in the mining industry for over 30 years. This is a highly efficient, fully integrated pump package solution for reducing the total cost of a mine dewatering program. The pump is based on the Epsilon Pump’s PowerDrive transmission providing increase reliability with no wearing components between the drive end and the pumping element. This technology is backed by a 10 year warranty. There are three models, including Series A, EZstrip TR muncher and Discam. 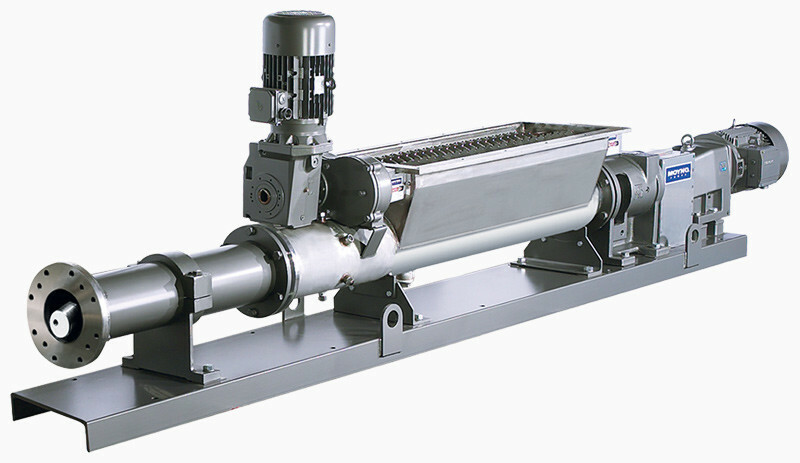 The reliable Series A muncher is well proven in its ability to macerate raw sewage, sludge, screenings, and industrial process flows. Available for pipeline of channel installations, the shaft speed of 85 rpm offers low cutter tip speeds and therefore dramatically reduces wear rates in comparison to high speed macerators. 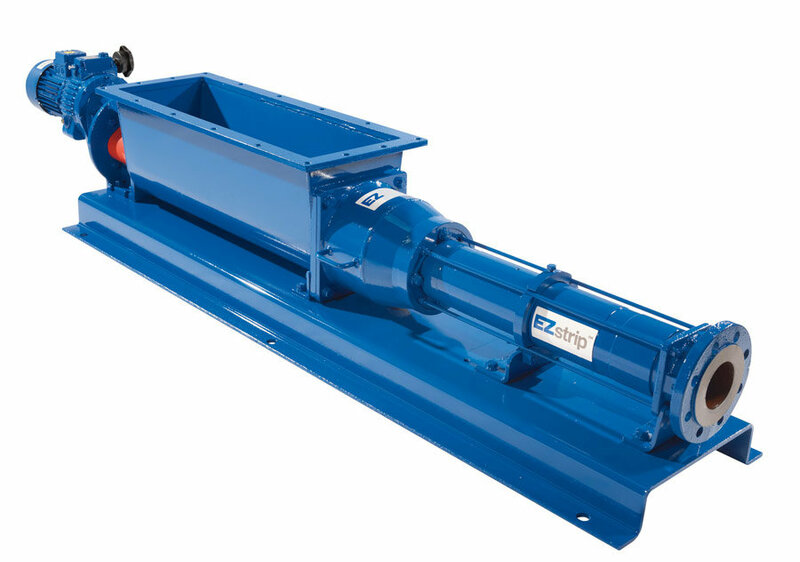 The Series A Muncher can be packaged with Moyno’s pump to provide a highly effective macerating, screening, or pumping system. The latest addition to the EZstrip family is a range of grinders offering a competitive solution to solids grinding and sludge conditioning. The EZstrip TR Munchers all house the quick release access port allowing the cutter assembly to be maintained in place without removing the equipment, reducing maintenance time. The Discam is a unique grinder and screen system, which offers a much more effective and low maintenance alternative to handling screenings than conventional systems. With the ability to capture up to 95% of solids at 5mm or 9mm aperture sizes, this innovative solution combines a self-cleaning screen with a high torque grinder. No manual attendance or cleaning is required and disposal costs for handling debris extracted by traditional screening process is eliminated.